It was a summer of growth for the National Women’s Hockey League. For the first time in the league’s young history, commissioner Dani Rylan announced the addition of a new team, the Minnesota Whitecaps. Shortly thereafter, the NWHL announced that the Whitecaps had an NHL partner in the Minnesota Wild and the first team-specific sponsorship with TRIA. The 2018 NWHL offseason was also filled with surprise free agent signings and departures. Shannon Szabados, an icon in Canadian women’s hockey, signed with the Buffalo Beauts, as did three members of Team USA’s gold medal-winning roster. Buffalo wasn’t the only team to make big changes over the summer. Every NWHL team has added at least one Olympian from the Pyeongchang Games to its roster. We can safely say that there’s more talent in the NWHL this year than ever before. This weekend, the 2018-19 NWHL season begins with a two-game series between the league’s newest team, the Whitecaps, and the league’s reigning Isobel Cup Champions, the Metropolitan Riveters. Here’s everything fans need to know before the puck drops. The Pride were able to bring back three members of Team USA’s gold medal-winning roster from the 2018 Olympics: Gigi Marvin, Amanda Pelkey and Haley Skarupa. They also added two CWHL imports in Taylor Wasylk and Dru Burns and signed four exceptionally talented rookies, including 2017 first overall pick goaltender Katie Burt. Boston also has its third head coach in as many years. Former NHL defenseman Paul Mara is taking over from fellow former NHL defenseman Thomas Poeck as Boston’s bench boss. Mara was an assistant coach for Team USA at the Pyeongchang Olympics and has been working with the national team since 2016, so he is already familiar with several of his most talented players. We can’t talk about the Pride without talking about the household names that did not return to the team after the 2018 Olympics. Team USA stars Brianna Decker and Kacey Bellamy chose to take their talents north of the border to play for the CWHL’s Calgary Inferno. Hilary Knight, the biggest name in women’s hockey, also chose to re-sign with Les Canadiennes de Montreal. Meghan Duggan, the captain of the USWNT, was recently married and it’s unclear whether or not she’ll be back on the ice this year. The biggest name from last year’s roster that is no longer with the Pride is All-Star center Janine Weber. Weber made history as the first player to sign an NWHL contract back in 2015, but remains a free agent. Versatile defender Meagan Mangene, who played a big role for the Pride last season, also remains unsigned. Denisa Krizova is one of the four rookies who signed with the Pride this summer. The two-way winger averaged 1.18 points per game at Northeastern University and is the sixth-highest scorer in the program’s history. Krizova should help give the Pride the scoring depth that they looked lost without last year. This year’s Pride roster is a far cry from the 2016-17 team that featured Decker, Bellamy, Knight, Duggan, Alex Carpenter, and Blake Bolden, but it still has a lot of talent. Marvin and rookie defender Toni Ann Miano will bolster the blue line; Burt could challenge Brittany Ott for the starting role; and Skarupa, Krizova, Pelkey, Jillian Dempsey, Dana Trivigno and Emily Field will give Boston a top-six forward group to be reckoned with. Mara is a capable coach and he has an abundance of talent to work with. Look for the Pride to rebound in a big way after a 4-8-4 finish last season. It would be another big disappointment for them to finish outside of the top three spots in the standings. No team added more talent over the summer than the Beauts. Szabados is one of the best goaltenders in the world, which is why her signing dominated the headlines this summer. Buffalo general manager Nik Fattey also signed three members of Team USA’s gold medal-winning roster from Pyeongchang: goaltender Nicole Hensley, high-scoring forward Dani Cameranesi and former Beauts captain Emily Pfalzer. Fattey also added former Connecticut Whale superstar Kelly Babstock, free agent winger Emily Janiga and brought former Pride defender Blake Bolden back to the NWHL after she spent a year lighting up the Swiss Women’s League. Kourtney Kunichika was one of three Beauts forwards who led the team in scoring last season, but she has yet to sign a contract. Jess Jones, who was the Beauts’ big free agent signing last year, chose to return to the CWHL to play with the Thunder. Also gone are 2018 NWHL Goaltender of the Year Amanda Leveille and the “Adrian Trio,” including All-Star speedster Kristin Lewicki. Clarkson University star Savannah Harmon is one of the best young offensive defenders in the game. Even if she isn’t on the Beauts’ top power play unit, she is going to pick up a lot of points this year and add some danger to a Buffalo defense that scored very few goals last season. We all know defense wins championships and the Beauts have a star-studded blue line and two Olympic goaltenders. Oh, and their forwards, led by Cameranesi and 2018 Rookie of the Year Hayley Scamurra, are pretty good, too. This team has been to the Isobel Cup Final all three years of the NWHL’s existence. The Beauts will be back in the final again this season, and could become the first team to lift the Isobel Cup for a second time. The Whale landed their biggest offseason addition just a few days ago when the club signed Finnish Olympic goaltender Meeri Raisanen. Raisanen has tested herself playing professional hockey against men in Finland and is exactly the kind of star that the Whale needed to add this offseason. She’s a proven elite goaltender who can keep the Whale in games regardless of who they’re playing. The Whale also added 2018 Korean Olympian Randi Griffin, Swedish forward Michelle Lowenhielm, Czech forward Katerina Mrazova and Russian netminder Mariya Sorokina this summer. Connecticut also signed six new faces from the ranks of NCAA D-III, including Melissa Sheeran, who averaged 1.66 points per game at SUNY Plattsburgh. Kelly Babstock, the franchise leader in more or less every statistical category, and captain Sam Faber (retirement) are both gone. The Whale also lost two of their best rookies from last year — Sydney Rossman and Amanda Boulier — to the Minnesota Whitecaps. Because Sam Donovan played in just two regular season games and one playoff contest last year, she will still be eligible for the NWHL’s Rookie of the Year Award. The Brown University alumna led her Ivy League school in scoring in her junior and senior seasons but is best known for her balanced two-way game. She’s on the smaller side, but has great instincts and can be trusted in every situation. Look for her to be a key contributor for the Whale this year. The Whale’s unique blend of European imports and NCAA D-III alumnae, including last year’s breakout player Emily Fluke, make them the hardest team to predict this year. For the moment, the Whale look like the team that will sink to the bottom of the standings, but there’s a reason we play the games and don’t just hand the trophies to the best teams on paper. Connecticut, despite its struggles, had a positive shot differential during 5-on-5 play last year. 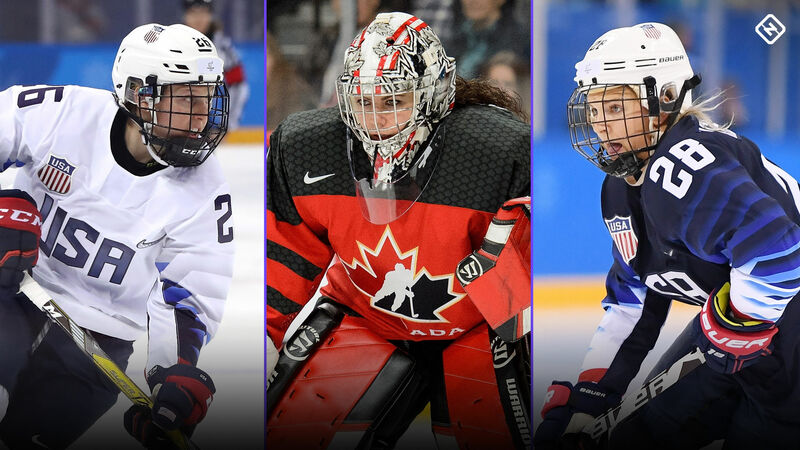 Now that the Whale have better goaltending and a few more forwards with valuable experience in major international tournaments, they have most of the ingredients they need to shock the world of women’s hockey. There was no bigger edition for the defending Isobel Cup champions than the return of Team USA star Amanda Kessel. The former Golden Gopher averaged 2.25 points per game in the 2016-17 season with the Riveters, so we should expect Kessel to put up some silly numbers this year. The Riveters’ other key addition on the ice was Kristin Lewicki. Lewicki finished her rookie season in Buffalo with five goals in 14 games. She’s one of the fastest players in the league, and should fit right in on a Riveters team that has a number of speedy forwards including Kessel and Rebecca Russo. The biggest addition off the ice for the Riveters is new head coach and former NHL defenseman Randy Velischek. Velischek joined the team in the 11th hour of the offseason and has some big shoes to fill as Chad Wiseman’s successor. Captain and shutdown defender Ashley “Stretch” Johnston, savvy veteran winger Bray Ketchum and the relentless Harrison Browne all retired as NWHL champions during the offseason. Also gone from last year’s championship roster is Canadian-born center Tatiana Rafter, who will be playing pro hockey in Russia this year. Velischek really liked what he saw from rookie defender Chelsea Ziadie in the Riveters’ Champions Cup loss against Lulea Hockey/MSSK on Sept. 29. The Harvard alumna is the early frontrunner to fill the roster spot left open with Johnston’s retirement. There’s a very good chance the Riveters are going to stumble out of the gate this year. Star winger Miye D’Oench won’t be with the team until mid-November, the Riveters have a new coach for the first time in franchise history, and they start the season with two road games in two days against the Whitecaps. According to the expected goals data from the groundbreaking women’s hockey analytics site Even-Strength.com, the Riveters’ offense punched well above its weight last year. With that being said, almost all of the Riveters’ biggest offensive contributors from last year have returned. Reigning NWHL MVP Alexa Gruschow and the NWHL’s top goal scorer, Madison Packer, both re-signed. So too did high-scoring defenders Courtney Burke, Jenny Ryan and Kelsey Koelzer. Thanks in large part to their blue line, the Riveters are going to be Isobel Cup Contenders this year, but the odds are against them finishing on top of the league standings. It’s a new NWHL. Kendall Coyne Schofield, Hannah Brandt and Lee Stecklein all won gold with Team USA in Pyeongchang and all signed one-year contracts with the Whitecaps this summer. Coyne Schofield and Brandt both have previous experience with the Whitecaps and will be the nucleus of the team’s offense. Stecklein, a 6-foot defender and former Golden Gopher, will be the star of Minnesota’s blue line. The Whitecaps also added talent from the NWHL’s other teams by signing goaltenders Amanda Leveille and Sydney Rossman and defender Amanda Boulier. All three players were NWHL All-Stars last year. Boulier’s skating ability should fit in perfectly with a Whitecaps team that is filled with fast skaters, including former speed skater Allie Thunstrom. The Whitecaps will have to play their first NWHL season without Team USA stars Jocelyne Lamoureux-Davidson and Monique Lamoureux-Morando. The iconic twin sisters are taking the year off from hockey to focus on building their families. Towering Finnish defender Mira Jalosuo played with Minnesota for the last two years, but she signed with Karpat in Finland during the offseason. She was a member of Team Finland’s roster for the Pyeongchang Olympics. Amy Menke is a talented young forward who should add scoring depth and tenacity to Minnesota’s lineup. Menke was the last captain of the University of North Dakota’s women’s hockey program. She led UND in scoring in her junior and senior seasons and had nine points in as many games in the SDHL last year with Djurgardens IF. The Whitecaps are leading the NWHL in season ticket sales for a good reason: They’re going to be a lot of fun to watch. On paper, Minnesota has a lot of offensive firepower and an absurd amount of team speed. The Whitecaps may be an expansion team, but they have a lot of pre-existing chemistry because of the 16 players returning from last year’s roster who signed NWHL contracts this summer. The biggest challenge for Minnesota this year will be its travel schedule, which consists of eight sets of back-to-back games. That is a lot of time in the air and in hotels for the league’s oldest roster, but the Whitecaps have more than enough depth to help give tired legs a rest when they need them. The Whitecaps could very well be the first team to win both a Clarkson Cup (as the champion of the CWHL) and an Isobel Cup.